DIRECT FROM LOURDES - Christmas Gift Set with Rosary & Angel. > 4 inch resin Christmas message angel. > Lourdes heart silver apparition rosary box with the image of the apparitions. Dimensions height 2.5 cm, width 4 cm. 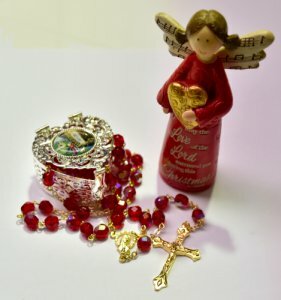 > Gold Virgin Mary red crystal rosary beads, the rosarys are boxed in a rosary box. Red Crystals beads measure 7 mm, the rosary measures 18 inches approx.